Rachel's Tomb is a sacred site located between Jerusalem and Bethlehem in the West Bank of Israel. It is of significant historical and religious site for Jews, Muslims and Christians. The site, believed to be the burial place of the biblical matriarch Rachel. She was the wife of Jacob and mother of two of his twelve sons. She died giving birth to Benjamin and "Jacob set a pillar upon her grave." The structure on the site, a cube topped by a dome, was built around 1620 by the Ottoman Turks. It was lengthened in 1860 by Sir Moses Montefiore. Due to the deteriorating security situation, the original domed structure was fortified and enclosed inside a building with a hall from the entrance in the 1990's. Recently, the site has been surrounded by a barrier to separate it from Bethlehem. Rachel's Tomb is difficult to visit because of its location near the Israel - West Bank border, but many still manage to visit this important sacred site. Only bullet-proof buses are allowed direct access to Rachel's Tomb. 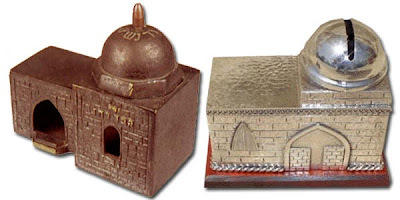 Souvenir buildings made of Rachel’s Tomb include a 3.5” tall brass replica from the 1960’s. 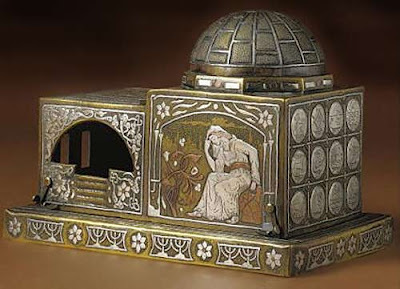 An antique box in the form of Rachel's tomb from 1915 was estimated at auction to sell for up to $40,000. (photo below) A tzedakah box styled after Rachel's Tomb is sterling silver with a wood base is hand worked by a family of Israeli silversmiths. Another version is a hand-painted, resin replica which includes an in-depth description on the bottom, outlining the name and historical significance. Unfortunately, I don’t know of a souvenir replica of The Church of the Nativity in Bethlehem, believed to be to site of Christ’s birth. Do you know other souvenir buildings from Israel? Let us know via the Comments link below.